My apologies. I wanted post this before I got too busy. I'll do the write up in a little while if I'm able to. I'll also try to do something with the photo. Thanks for your patience and understanding. You can use up to 2 1/4 cups sugar without increasing the volume of the liquid ingredients. It all depends on how sweet you want the mochi to be. Add one stick unsalted butter to a microwave safe bowl and melt in microwave for 30 seconds. Add sugar and mix until well combined. Add vanilla extract, then add eggs, one at a time. Mix until well incorporated. Add in mochiko flour and baking powder, and continue to mix. Combine evaporated milk and water in a separate bowl. Whisk to blend. Add to mochiko mixture in 2 parts, mixing well between addtions. Next add in coconut milk, whisking until well blended. Pour mixture into a 9” x 13” pan and bake for one hour at 350F. Promptly remove from oven, and let cool completely. 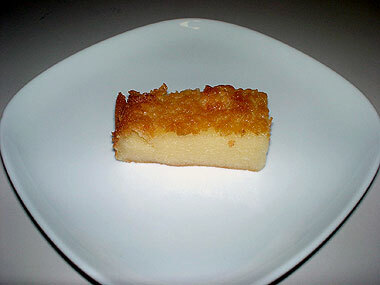 To serve, cut into 1“ x 2” bars. Topped with shredded coconut if desired. Hi, just wanted to say I've made this recipe several times. It is very reminiscent of my Japanese mother's version she'd make when I was a little girl. I use salted butter and it comes out just fine. However, I'd stick to the 1.5 cups of sugar. I tried 2 cups and it was way too sweet. Thank you for posting this recipe! I have been looking for one for a long time. Made it yesterday and, oh my goodness, it is soooo good!!! Reminds me of when I was a kid in Hawaii, or should I say small kid time? :) Thanks for the variation, with or without coconut milk. I have some friends that won't/can't have it. This is a winner and have been told by the family that I can make it anytime I want!